Eisenhower Fellows Jael Wettach-Glosser (left) and Greg Norton (right) at TRB, with PSU undergraduate student Katherine Keeling (center). Travis Glick is a PhD student, graduate teaching and research assistant in civil & environmental engineering at Portland State University. His doctoral work tackles a new class of problem that accounts for multiple routes and multiple service connections. 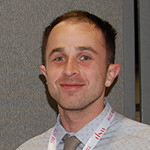 He presented research on bus dwell times, bus-bike conflicts and transit modeling at the 2019 annual meeting of the Transportation Research Board (TRB). Learn more about Travis's research by watching his presentation of TRB research from 2018. 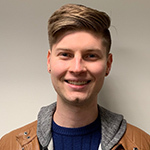 Mike McQueen is a first year master's student currently working with John MacArthur of TREC and Dr. Kelly Clifton of Portland State University. He has researched e-bike purchase incentive programs, the potential of e-bikes to reduce automobile use and emissions in Portland, and BIKETOWN. He plans to study travel behavior surrounding walking, scooter/bike share, and public transit as an Eisenhower Fellow. Greg Norton is a first year masters student pursuing a degree in Structural Engineering. The goal of his research is to improve the seismic resilience of Oregon’s transportation infrastructure by developing and implementing a rapid repair methodology for concrete bridge columns prior to the Cascadia Subduction Zone Earthquake hitting our region. This repair method differs from conventional methods because it will restore the column to its original stiffness while increasing the ductility thus improving the resilience for future earthquakes including aftershocks. 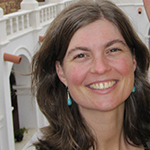 Kelly Rodgers is a PhD student in urban studies at Portland State University. Her research uses a realist approach to systematic review to explore the heterogeneity of travel behavior. Typically, systematic review and meta-analysis are used to distill research into conclusive findings of “what works.” Yet many researchers conclude that it is difficult to generalize review results because the outcomes depend on context. Rapid Realist Review not only synthesizes the effectiveness of strategies but also is responsive to policy needs by focusing on particular interventions that relate outcomes of interest and the contexts that produce them. Learn more about Kelly's research by watching her presentation of TRB research from 2018. 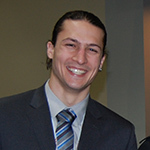 Baxter Shandobil is a first year student in the Master of Urban and Regional Planning (MURP) program at Portland State University. 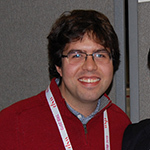 He worked with Kelly Clifton, Joe Broach and John MacArthur on a project that formed the basis of the TRB paper, Making Alternative Fuel Vehicles Work for Everyone: Quantifying the Environmental and Equity Potential, which was presented at a poster session this year. This coming term, he will begin work on the project for which he was awarded an Eisenhower Fellowship; an analysis of the travel behavior of ride hailing app users in Portland, Oregon. Learn more about Baxter's research by reading about an equity & electric vehicle study he worked on. Jael Wettach-Glosser is pursuing his M.S. in civil engineering in the Maseeh College of Engineering & Computer Science at Portland State University. His research is focused on exploring the factors that drive concrete bridge deck deterioration in order to improve performance monitoring in the future. He is also looking into the relationship between deterioration modeling and asset management to increase bridge service life. 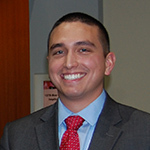 Santiago Espinosa Wild is a second year master's student in Civil Engineering; his focus is in transportation. He is the current president of the STEP (Students in Transportation Engineering and Planning) ITE student chapter at Portland State University. 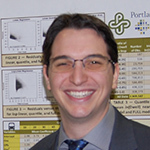 He has done research regarding pedestrian and motor vehicle behavior on crosswalks at busy streets in Portland. His interests span bicycle infrastructure design, multimodal travel simulation, and safety issues on our roads, sidewalks and bikeways. His commuter mode is a bicycle. The Dwight David Eisenhower Transportation Fellowship Program advances the transportation workforce by helping to attract the nation's brightest minds to the field of transportation, encouraging future transportation professionals to seek advanced degrees, and helping to retain top talent in the U.S. transportation industry.